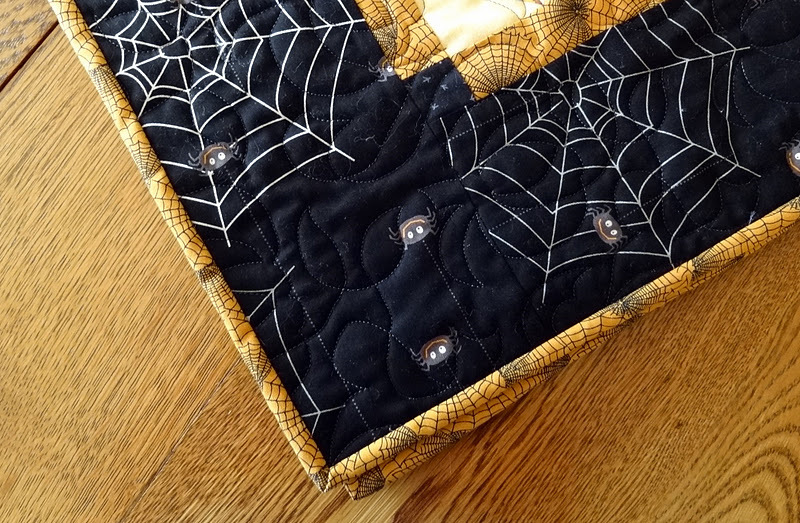 Squash House Quilts: Spooky Supreme Peek and Hexagon Madness! I finished another Supreme pattern test the other day, but because it's a pattern that won't be released until next year, I can only show you a peek! I had so much fun making this one! 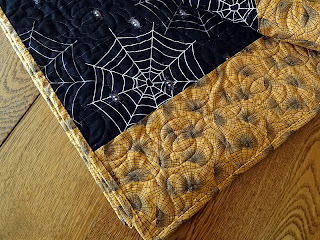 Stephanie gives me free rein to use whatever fabric I want, so I decided to delve into my rather large Halloween stash! This is the front - wish I could show more, but you'll just have to be patient! Here is a peek at the back. Thanks to a most kind "donation" from Julie over at Me and My Stitches, I had enough of the orange, spider webby fabric to bind the quilt and tie it all together! Thanks again, Julie! I have Pam Buda of Heartspun Quilts to blame for my latest addiction ongoing project - Hexagons! Check out her blog for a wonderful, 3-part tutorial on how to make these little gems! I read the tutorial through several times and also purchased her Hexagon Starter Kit and it's off to the races! I plan to work my way through my entire scrap bin for a one-of-a-kind hexagon quilt! In the photo above are my first 6 hexagons - so easy and so fun with Pam's instructions. The hexagon sitting by itself on the bottom came with Pam's kit which is so helpful! Been wanting to make these like I have? Go have a peek and see how easy and fun it is! You've seen me post this quilt before, but check out the little figures on top of the rack! They are from a local artist and I've begun collecting them here and there for different seasonal displays! I took my camera with me the other day on my daily walk. The leaves are changing must faster this year, and oh, so beautiful! Here are 3 of the 4 Dogwoods in front of the house. Soon there will be nothing but the red berries left and the Flicker's will be feasting until they are gone! Our mailman told me this bush is a Euonymous. There are many different varieties but this one that turns red in the fall is all over town. I'll be looking to plant one at the Squash House! 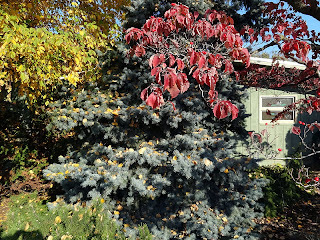 I loved this Colorado Blue Spruce covered with leaves fallen from another tree. And how nice it would be to sit on this bench with a hot cup of tea and your favorite quilting magazine on a sunny, fall day! I so love your Spooky Supreme quilt. 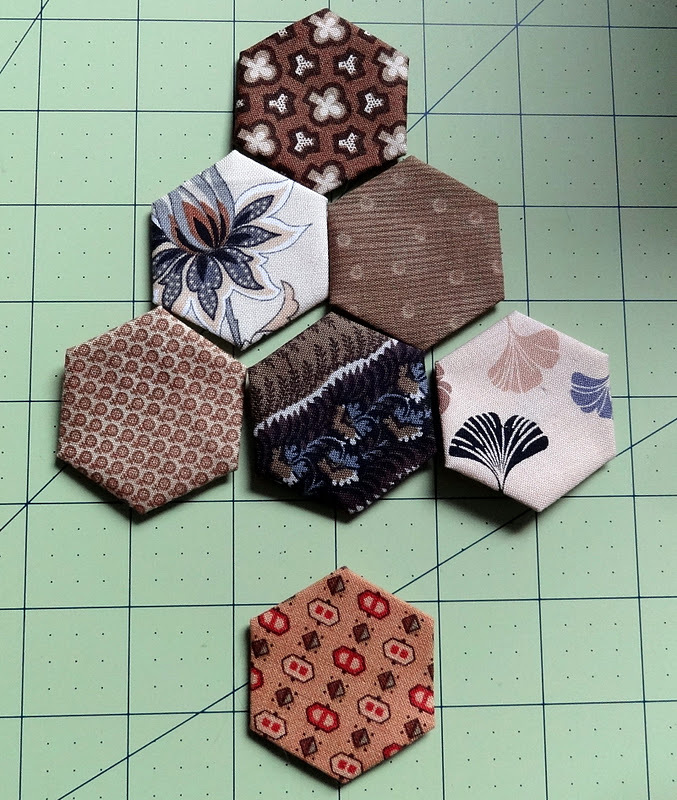 :o) Cute little hexies but don't think I'll ever have the patience to make them. Isn't fall glorious? Mother Nature at her finest. Good luck with that Hexi addiction. 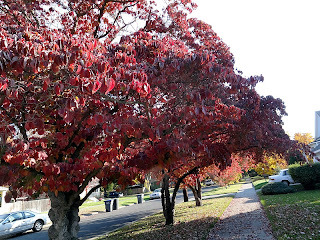 ;-) Love the colors, I keep meaning to take my camera, I must do that today and show the Pacific NW fall. You have some fun projects going on over there, and those pictures are just awesome! What a beautiful view as you're taking your walk. All those colors outside are gorgeous! The hexi's can become addicting. Watch out! Pretty spooky Supreme quilt! Your hexagons are beautiful, just keep the quilt moderate size! It took me over ten yars to finish a big hexagon quilt. The autumn colours are beautiful. I'll meet you on the bench some day, at two in the afternoon. I can't wait for the reveal! From what I can see, I know I'm gonna love it. I have a hexi quilt on the go but I haven't even looked at it since we moved. Maybe it's time to take it out again. Love the colors in this post. Isn't fall the best time of year? So glad to be able to have a little peek at your quilt, but I want to see the whole thing!! It looks awesome. Glad I could help with the fabric. Love your hexies! I haven't jumped on the Hexi train just yet...I'll watch your progress from a distance. Sweet peek...you are such a tease! I have been by for a while and so enjoyed your blog post today! I am glad you are still around. 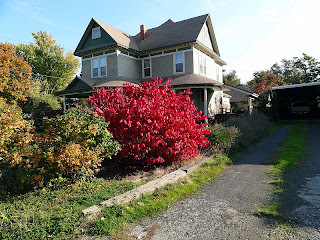 Loved the sneak peek and the photos of your area in Fall. I'm so glad you found the fabric to finish this Hallowen quilt. I will be eagerly waiting for its unveiling. Your Halloween decorations are adorable! 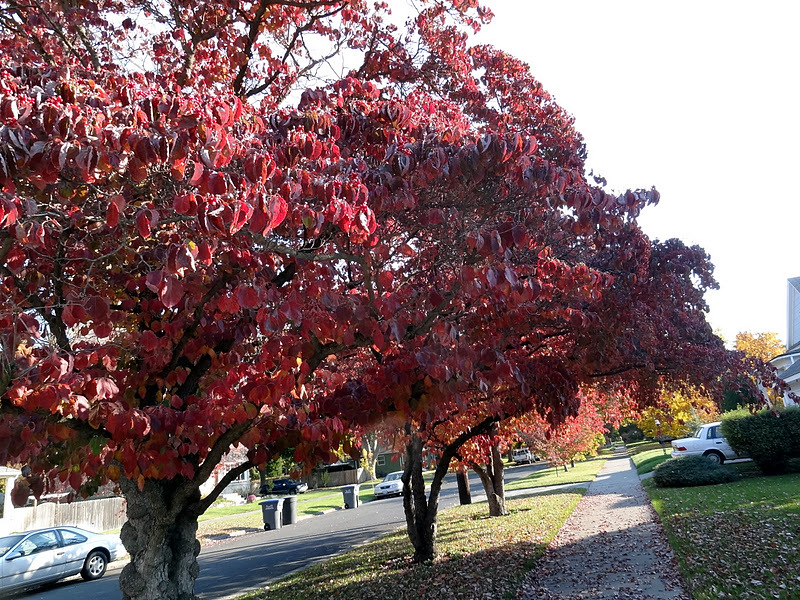 Thank you for sharing Fall colors in your neighborhood. They are wonderful! Ooo a sneaky peeky! Looks interesting. I did octagons and squares over papers a while back in a Sudoku pattern so the colours balanced. Time consuming but good fun. If you like the technique, it's worth looking at the Quilts of Lucy M Boston book. Beautiful reds! Autumn is my fav season. The owl, mouse and witch are too cute! Perfect with your Halloween quilt. Oh, such a tease with that quilt. Hexagons are very relaxing to make. Have fun. Great fall photos. Can't wait to see more of that quilt!!! Love what I'm seeing. I love your little Halloween display! Your little friends are darling. 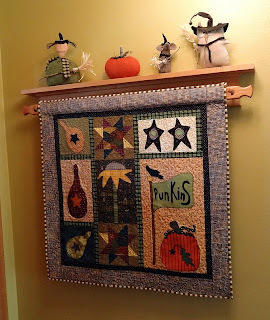 Of course, love the quilt and rack too. :-) Gorgeous fall pics. I can't believe its November already!! Ha...you've joined those addicted to the hexagons! I can't go there...don't need one more thing on my plate (but I DID give it some consideration). 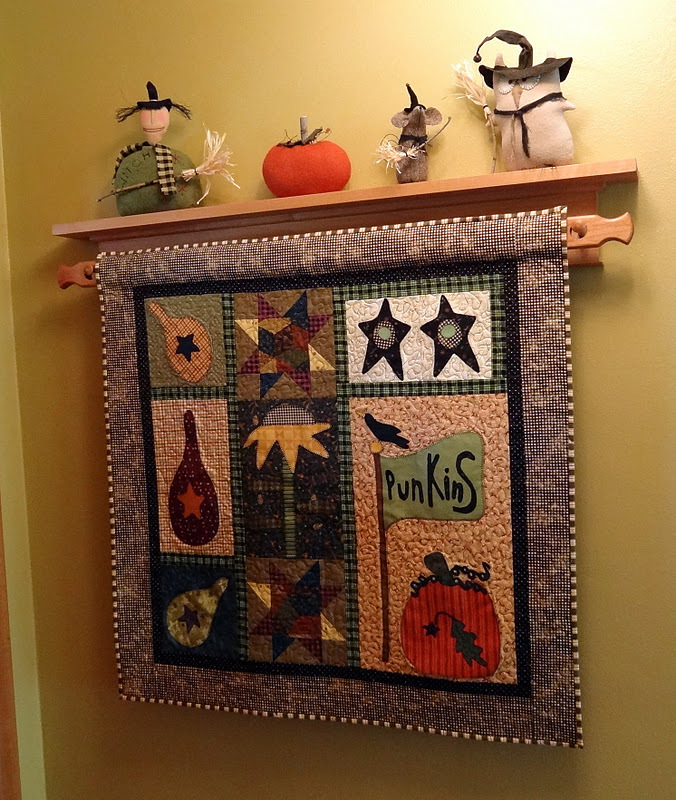 Can't wait to be able to see the halloween quilt. Such a tease you are! Beautiful fall pictures, such a nice time of year. Soon all of our wonderful leaves will be gone. Good luck with hexies. Was that a little owl on top of your shelf? I like him!